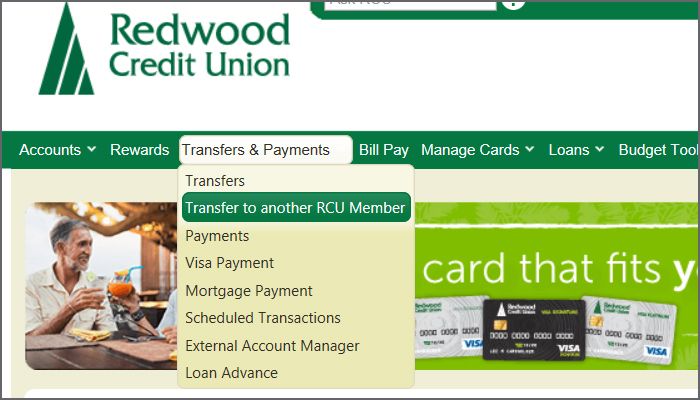 How do I make a transfer to another Member’s account in RCU Online banking? Log into RCU Online Banking. Under the Transfers & Payments tab, select “Transfer to Another RCU Member." Enter the necessary information: transfer source account, the transfer destination account, the first 3 letters of the receiving Member's last name, the receiving Member's full account number,amount you wish to transfer and select time/frequency. Add a customized comment to the transfer if you wish.